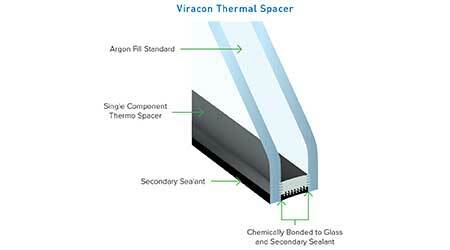 The Viracon Thermal Spacer (VTS) replaces the traditional combination of metal spacer, desiccant and primary sealant with a better-performing single component. The proprietary formulation of VTS consists of a black thermoplastic elastomer with integrated desiccant and primary sealant that is chemically bonded directly to the glass and secondary sealant. The extrusion method for the thermoplastic material results in a smooth, continuous, matte black finish without shine, perforation marks or seams and there is no separate PIB component so there can be no PIB movement. In addition, edge deletion is placed within the VTS, improving the edge of glass aesthetics. Thermal performance is 14.4 percent better than aluminum spacers and condensation resistance is notably higher. VTS is available in a range of thicknesses, and units produced with VTS include an argon fill. The primary seal has 35 percent better argon retention and increased stability in extreme hot or cold temperatures. VTS is available for any size IGU up to130 by 236 inches maximum. It can be combined with Viracon’s other fabrication options including lamination, silk-screen or digital print, and the broad selection of Viracon’s proprietary glass coatings that can be applied to a variety of tinted substrates. Supported by a Special Twelve (12) Year Limited Viracon Thermal Spacer (VTS) Insulating Glass Seal Warranty.